As one of the most well-respected manufacturers of high-quality backpacking tents, Kelty is no stranger to creating lightweight, but robust, tent solutions that can be used for backcountry excursions or car camping. The Kelty Salida 2 is no exception. Priced very conservatively in the lightweight tent space, the Salida 2 is available here for a reasonable price. For tent weighing just over four pounds, you would be hard pressed to find anything else of comparable quality in this price range that is light enough to be carried in a backpack. 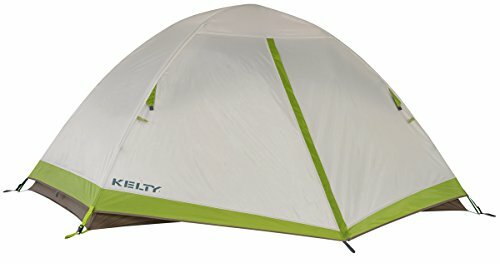 The Kelty Salida 2 is a two person freestanding tent that includes both an inner tent and a separate rain fly. The inner tent is made almost entirely out of mesh to allow for excellent ventilation. The floor of the inner tent is a PU coated bathtub floor design and there is a large side door that opens into the vestibule created by the rain fly. 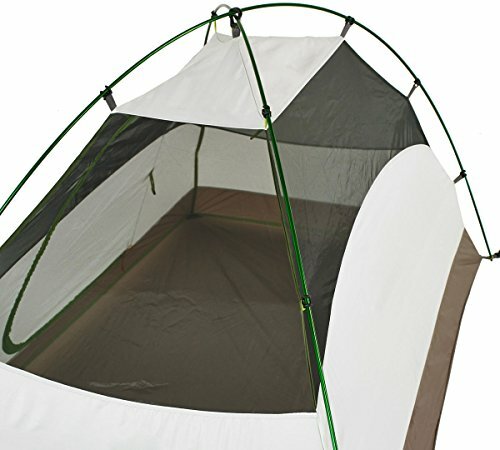 The rain fly is designed to drape over the inner tent and creates the aforementioned front vestibule as well as two doors that can be secured using guy lines. The fly is fully seam sealed to improve the water resistance of the Salida 2 out of the box, but the floor seams of the inner tent are not. If you plan to use the Salida 2 in wet weather, make sure to seam seal the floor and/or use a footprint to prevent water from seeping into the floor area of the inner tent. The freestanding tent design makes it extremely quick and easy to pitch the Salida 2. The included collapsible aluminum poles are connected using shock cord and cross each other at the top of the tent. The poles are connected to the inner tent using a clip system so there is no need to fish tent poles through fabric sleeves like so many less expensive tents. Once the inner tent has been pitched, the rain fly simply drapes over the inner tent and pole structure and is secured to the corner clips found on the inner tent. Although using collapsible tent poles instead of repurposing trekking poles usually adds a lot of weight to the tent, the freestanding design makes it simple to erect this tent in just about any location within a matter of minutes. 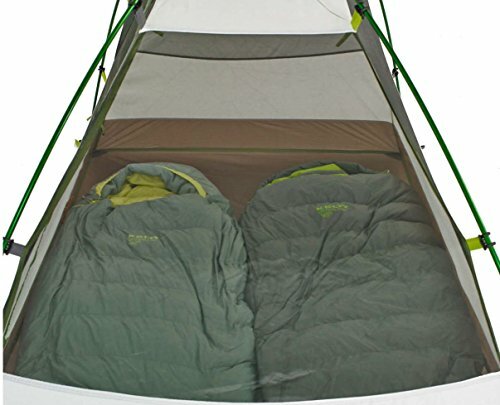 The inner tent is very spacious and easily accommodates two people and sleeping pads for both. The steep inner walls of the tent add to the feeling of spaciousness and the inner tent floor is long enough to lie in a six foot sleeping bag without touching the walls. The inner tent also features ample gear loops to hang lighting and other accessories and the included gear loft can be used to dry clothing out overnight or to stash flashlights and other small items. Mesh pockets are also found in the corners of the inner tent for additional gear storage. The rain fly of this tent is perhaps the one place where Kelty could have done a little better. The distinctive dome shape of the fly is designed to fit over the inner tent like a second skin. The problem with this design is that condensation often builds up in wet weather as there is not adequate ventilation when the rain fly is attached. In arid climates, the door can be left open to avoid condensation problems but during a rainstorm this isn’t an option and you could very well wake up in a wet sleeping bag. One option to consider is to ditch the fly completely in exchange for an 8’ x 8’ silynylon tarp. Not only will this tarp be much lighter than the included rain fly but it can be pitched over the tent with more room for ventilation between the tarp and the inner tent. In theory, switching out the fly for a suitable tarp could save nearly a pound of weight and really bring this tent into the ultralight category. At $160 (For the latest prices and discounts, check here), the Kelty Salida 2 is one of the most affordable lightweight backpacking tents on the market. Lighter tents do exist but many of these tents cost twice as much as the Salida 2 and many of them require the use of trekking poles to erect the tent. The free standing design of this tent does add a little weight to the unit but is perfect for someone wanting a lightweight tent that can be pitched in minutes. Overall, the Kelty Salida 2 is an excellent choice for someone looking for a lightweight, yet affordable backpacking tent. Without the rain fly, the inner tent provides good ventilation and although condensation can be a problem when the fly is attached, the rain fly effectively keeps moisture outside the tent where it belongs.